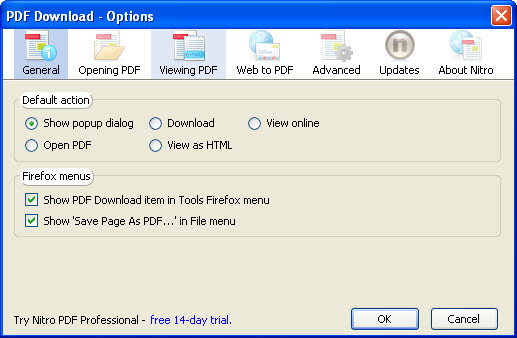 PDF Download by Nitro PDF Software is a free browser extension for viewing and creating Web-based PDF files. It removes the pain you can experience when you encounter PDF files online, reducing browser crashes, speeding up the display of a PDF’s content, and letting you convert any (unsecured) Web page into a high-quality PDF that’s great for archiving, printing and sharing.Some of its features include View PDF online,Convert Web pages to PDF,View PDF as HTML,Control PDF files in Firefox,available in 19 languages. It is also available for IE,safari and chrome. Download PDF Download from above links and restart your firefox.